Ryder's biography is well-written and enthralling, sprinkled with great stories, and highly recommended for community library music collections as well as any fan of the man himself. Songs performed by Detroit rocker Mitch Ryder, such as "Devil with a Blue Dress On/Good Golly Miss Molly" and "Jenny Take a Ride" are among the most well loved of the twentieth century, but his fascinating life story is unknown to many. It Was All Right is a portrait of Ryder built on firsthand "road stories"—a rock-and-roll travelogue that is also an insider’s look at fame and popular culture in America. Born in 1945 in Hamtramck, Michigan, Ryder has been in the music business for 47 years, made more than two dozen albums’ worth of recordings, and given upward of 8,000 performances. 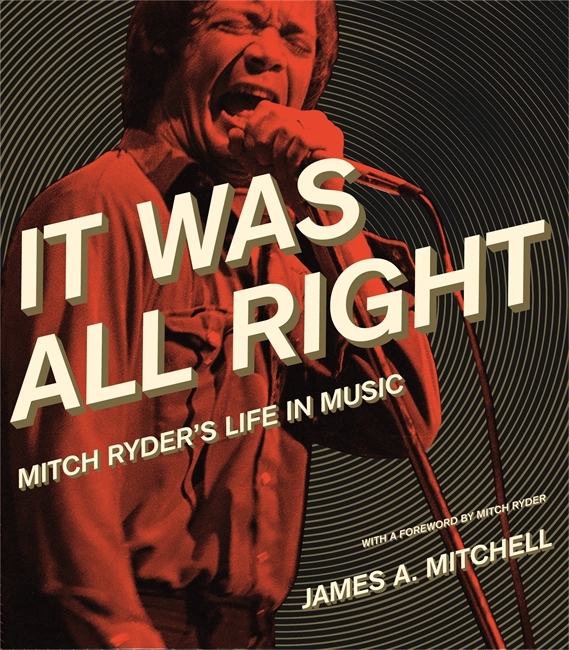 In It Was All Right, author James A. Mitchell has collected an impressive array of anecdotes from Ryder’s extraordinary life in music, including Ryder’s stories of his first gigs in Greenwich Village clubs, singing with a black trio in the early days of the civil rights movement, jamming with Jimi Hendrix, and attending private parties thrown by the Beatles. Mitchell also chronicles Ryder’s more recent career, as he struggled to regain his popularity among American audiences after the 1970s and returned home to the Detroit music scene in the 1980s. In all, Ryder’s abundant commentary and Mitchell’s easy narration combine to give readers a fast-paced tour of a turbulent musical journey that is still unfolding. Whether blending musical genres or dabbling in political activism, Ryder’s one-of-a-kind experiences will intrigue music fans and anyone interested in musical or cultural history. James A. Mitchell is a writer and community journalist based in southeast Michigan. He is also the author of Applegate: Freedom of the Press in a Small Town and the forthcoming But For the Grace: Profiles in Peace From a Nation at War, based on his travels to an orphanage in Sri Lanka’s war-torn northeast. Mitch Ryder is one of rock and roll's great unsung heroes, and his story has been criminally untold-or at least under-told-until now. It Was All Right may take its title from a Lou Reed lyric, but it captures the development of one of rock's great voices and great personalities, a ride alongside a career of dizzying ups and downs that has nevertheless maintained dignity and passion. Anyone who reads this will start chanting 'Where's Mitch?!' along with everybody else who thinks Ryder's induction into the Rock and Roll Hall of Fame is overdue. I'm grateful for this inside view of the life and times of Mitch Ryder. It's a story that needed to be told and should be required reading for all young musicians. If you think a hit record will deliver you to a good life, think again. Such is the great lie of fame. This book is the truth of fame for 99.99 % of those who achieve it. Mitch's struggle for fulfillment and dignity in the modern culture industry is a warning for all who choose it. Not that anyone should be discouraged from a life in the arts, but be aware, it's no walk in the park. That Ryder is still singing in his wonderful, deeply soulful voice is a gift to us all. That he's told his cautionary tale is even better. Pardon my dust, but this long-overdue tome proves what everyone from the Stooges to Bob Seger has been saying for decades: that the high octane missing link between Motown and everything else that ever roared out of the Motor City is Mitch Ryder and The Detroit Wheels! Whether the soundtrack of your early years included Mitch Ryder and the Detroit Wheels or if you're new to American pop culture of the volatile 1960s and 1970s, It Was All Right will galvanize you. It's an intimate, spot-on look at the world of rock, celebrity, and Detroit's continuing contribution to world culture. Ryder's biography is well-written and enthralling, sprinkled with great stories, and highly recommended for community library music collections as well as any fan of the man himself." It Was All Right intelligently and personally gives us insight into Mitch Ryder as a pop culture icon - from Richard Nixon repeating Mitch's famous 'Sock It to Me' on Laugh In to 'Devil With a Blue Dress On' becoming a rock anthem - and reveals Mitch as a deeply empathic and creative individual. Mitch's story is really the story of an art form, its business, and its effects on us all, both positive and negative. Cheers to Mitch and cheers to James A. Mitchell for capturing it all.